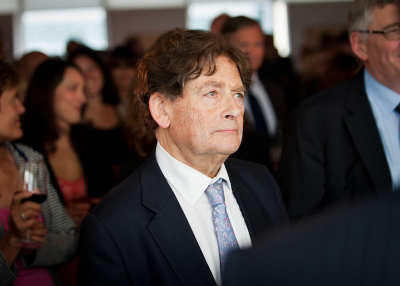 Nigel Lawson, Baron Lawson of Blaby PC (born 11 March 1932) is a British Conservative politician and journalist. He was a member of parliament (MP) representing the constituency of Blaby from 1974 to 1992, and served in the Thatcher Cabinet from 1981 to 1989. Prior to entering the Cabinet, he served as the Financial Secretary to the Treasury from May 1979 until his promotion to Secretary of State for Energy. He was appointed as Chancellor of the Exchequer in June 1983, and served until his resignation in October 1989. In both Cabinet posts he was a key proponent of Thatcher’s policy of privatisation of several key industries and deregulation and oversaw the Big Bang launched in London on 27 October 1986. Lawson was a backbencher from 1989 until he retired in 1992, and now sits in the House of Lords. He is still active in political life as President of Conservatives for Britain, a campaign for Britain to leave the European Union, and as chairman of the climate sceptic Global Warming Policy Foundation think tank. He is the father of six children, including Nigella Lawson, a food writer and celebrity cook, Dominic Lawson, a journalist, and Tom Lawson, headmaster of Eastbourne College. Lawson was born in 1932 to a wealthy Jewish family living in Hampstead, London. His father, Ralph Lawson (1904–1982), was the owner of a commodity-trading firm in the City of London, while his mother, Joan Elisa Davis, was also from a prosperous family of stockbrokers. His paternal grandfather, Gustav Leibson, a merchant from Mitau (now Jelgava in Latvia), changed his name from Leibson to Lawson in 1925, having become a British Citizen in 1911. Lawson was educated at two independent schools: at Beechwood Park School in Markyate (nr. St Albans) in Hertfordshire, followed by Westminster School in London (following in his father’s footsteps), and Christ Church, Oxford, where he gained a first-class honours degree in Philosophy, Politics and Economics. Lawson carried out his National Service as a Royal Navy officer, during which time he commanded a fast patrol boat, HMS Gay Charger. Lawson began his career as a journalist at the Financial Times in 1956, writing the Lexicon column. He progressed to the positions of City editor of The Sunday Telegraph in 1961 – where he introduced his friend Jim Slater’s Capitalist investing column – and then editor of The Spectator (1966–1970). Lord Lawson has been married twice having children from both relationships. Lord Lawson is a member of the Garrick, Beefsteak and Pratt’s Clubs.